I love coffee cake, especially those with huge knobs of buttery crumb topping and have it with a cup of coffee. 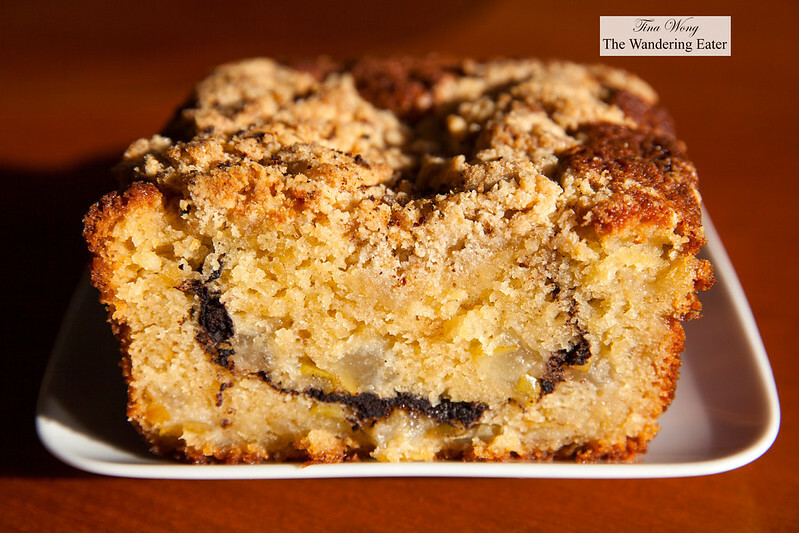 When I came across the pear coffee cake recipe from the famed restaurant team of Eleven Madison Park’s book, I Love New York: Ingredients and Recipes it struck me as an interesting variation of that cake since I never had it made with fruit. Since it is a fancy recipe with no calories spared, I thought of toning down the fat content ever so slightly by replacing the crème fraîche with Icelandic Provisions skyr. 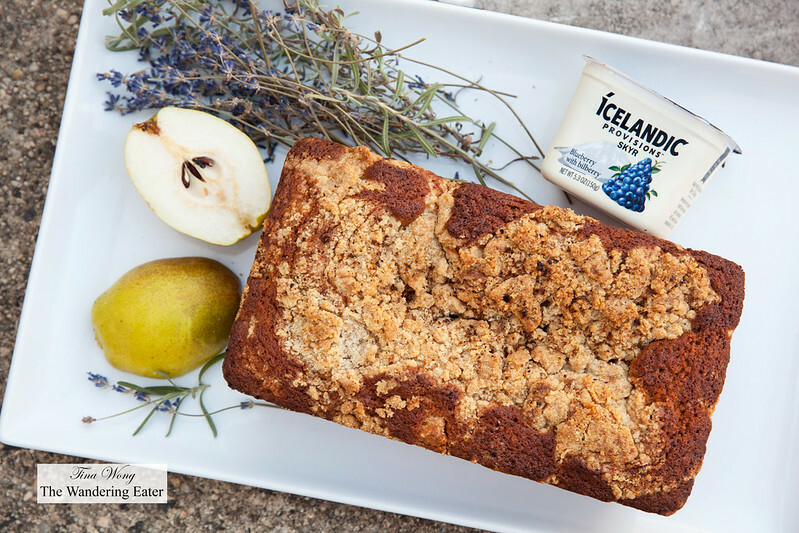 Skyr is a cultured product made from Iceland. If you have not tried skyr, its texture is similar to the Greek yogurt but it’s not as tart and it is technically a cheese. Icelandic Provision’ skyr is made with low fat milk and heirloom skyr cultures — and takes 4 cups of milk to make 1 cup of skyr. 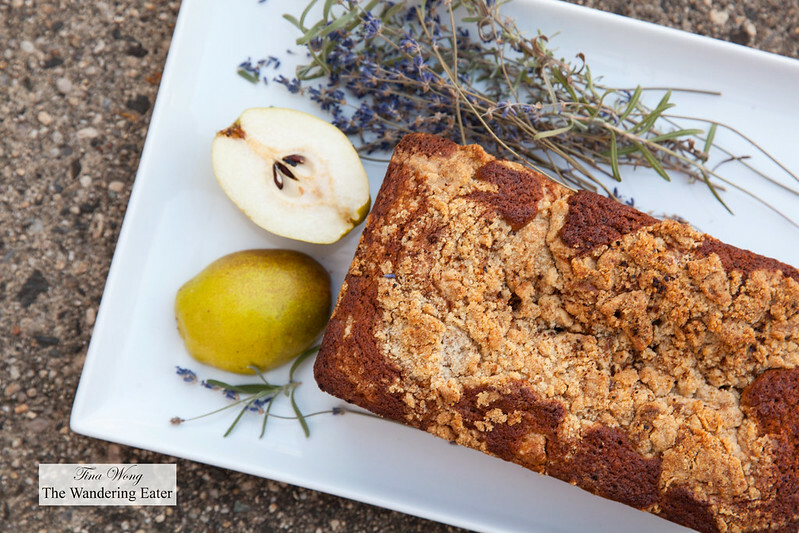 The result of the pear coffee cake is a rich, moist cake with tender crumb with lots of flavor from the swirl and I’ve added finely ground juniper berries since I’ve infused my pears with Citadelle gin instead of pear brandy. Mix the pears, gin, and sugar together in a bowl. Cover and refrigerate overnight. The next day, before making the cake, drain, reserving both the liquid and the pears. In a stand mixer fitted with the paddle attachment, beat together all of the ingredients on medium speed until the mixture is crumbly. Refrigerate until ready to use. Preheat oven to 325°F. Butter and flour a 9×5-inch loaf pan. IN the bowl of a stand mixer fitted with a paddle attachment, cream the butter with the granulated sugar, brown sugar, and salt until light and fluffy. Add the eggs one at a time, and then add the skyr, vanilla, and 1 tablespoon of macerated pear liquid. Into a separate bowl, sift together the flour, baking powder, and baking soda. Lower the mixer speed and add the flour mixture into the batter, mixing until just combined. Finish folding with a spatula to make sure the batter is completely mixed. Fold in the drained macerated pears. Spoon half the batter into the prepared loaf pan and spread it into an even layer with an offset spatula. Sift half of the swirl over the batter to evenly coat. Spoon the remaining batter into the pan, spread it out and sift the remaining swirl mixture on top. Scatter the crumble over the batter and bake for 50 to 60 minutes, until a cake tester comes out clean when inserted into the center of the cake. Cool for 30 minutes in the loaf pan. Gently turn out the cake onto a cooling rack, set it upright, and cool to room temperature.